Lois argues with Perry on the phone about her decision to leave the Planet when suddenly Superman crashes through the window.�Grabbing her husband, Lois asks him what is wrong.�He tells her that he is seeing everything twice.�He feels like he has seen the future. Clark tells her that he was out looking for Supergirl, checking all of the sites she had previously appeared at.�He visited the caf� selling Yes! But all he found was a crowd of eager consumers.�As he thought about the nature of time, he suddenly found the fortress of the Futuresmiths hovering above Metropolis. As he realized that he would have to destroy the ship, Supergirl suddenly appeared.�He tells her that he needs to stop the Futuresmiths now.�He tells Cir-el that he isn't mad at her; he just wants to know the truth.�Then, with the girl in tow, he heads for the fortress. Clark apologizes for all of the secrets that he has been keeping from her, but Lois tells him that it does not matter and that she just wants to know what he saw.�He tells her he saw the future.�He saw the revolt of the Metropolis drones 2 years from now.�Suddenly, the Futuresmiths appear behind the duo. Superman demands to know who they are, and they tell him that they are engineers of the future.�They use their technology to bring things like Cir-el to the present day.�Cir-el goes running off but Superman stays with the Smiths. Suddenly, the Futuresmiths begin to replicate themselves and Superman panics.�He flies away as fast as he can, straight into a portal to the future.�Emerging through, he witnesses a robotic version of himself attacking Metropolis.�Ripping himself free from the time fold, Superman finds the Futuresmiths about to kill Cir-el.�Racing towards her, he gathers her up and blasts out of the fortress, shooting a blast of heat vision in his wake. Following the rescue, they both head to S.T.A.R. Labs, where they have Supergirl undergo genetic testing.�The reports clearly show that Cir-el is Superman's daughter, but Lois is not the mother. Shocked, Lois walks away from her husband.�She questions whether this is all real, or whether it is just meant to confuse him.�As she walks back to him, the time loop sets in and Superman begins telling his wife about invading the Futuresmiths' fortress, and once again he has the strange feeling that it has happened before. Story - 2: If you can't wow them with wisdom, then baffle them with bull.��That's what I get from this story.�It's about three or four pages of content, stretched out to 22 with the use of a clumsy narrative dialogue, and a confusing and redundant occurrence of deja vu.�Why is Superman in a time loop?�If the Futuresmiths' really have that kind of power, then what's the point of all this maneuvering if they can just manipulate time.�So this issue we find out the Cir-el is Clark's, but not Lois'.�Oh no!�Can you imagine the problems this will cause for the married couple, knowing that in the future Clark will be with another woman?�Unless of course you consider that Cir-el is just going to be from an alternate future and once issue 202 or so rolls around she'll be nothing but a bad memory.�There was nothing entertaining in this issue.�We saw the Futuresmiths' stand around and talk some more.�We saw Cir-el continue to act like a 6-year old.�We even go to see a future where Metropolis is turning people into robots, and turns Superman.�WHAT!?! ?�What is going on here?�Why do I even need to write sentences like that?�Where do story concepts like this come from?�I'm done.�I don't know what I can say anymore.�Neal pretty much covered it all in his tirade last issue.�All I can say is at least there is light at the end of the tunnel.�A few more months and we'll have new writers, and new artists, and hopefully a lot more happy reviewers around here.�Because I, for one, am getting sick of reviewing bad books. Art - 2: Same as always.�I really don't like it.�Everything is lacking in detail, out of proportion, and overall just plain ugly.�Something like this could work on a number of other books, but sure not on Superman. 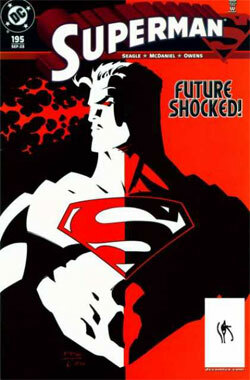 Cover Art - 3: The cover is somewhat appealing to me.�I like the contrast used.�And I like the boldness of the cover.�I do not, however, like the fact that it has absolutely, complete, nothing to do with the story.�The Superman on the cover does not look 'Future Shocked'.�He looks more like he's modeling for a mini-bust sculpture.�Symbolic covers are fine, for the right kind of issue, but I am getting sick of every artist just using the cover of the book as an excuse to draw a splash image.�Tie it in to the interior art.�When I am paging through my collection 15 years from now I want to be able to look at a cover and remember what happened in the issue. It makes sense to me, so why doesn't it make sense to the guys at DC?